Nature`s finest will add some Christmas Cheer to any home. 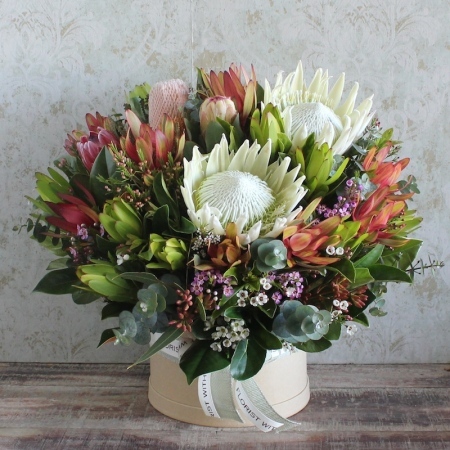 This stunning mix of wild flowers is quite an impressive choice, delivered in a natural brown Hat Box, we are certain this native arrangement will be well received. If its a long lasting gift you are looking for, look no further. Native flowers can last up to 4 weeks in an arrangement and come in a variety of colours and textures. Order online now or phone our friendly staff on 02 9871 1666. Delivery available to all areas of Sydney.